I’m so excited to be joining this very special stampede blog hop, celebrating Mama Elephant’s 6th Birthday and their September 2018 release! 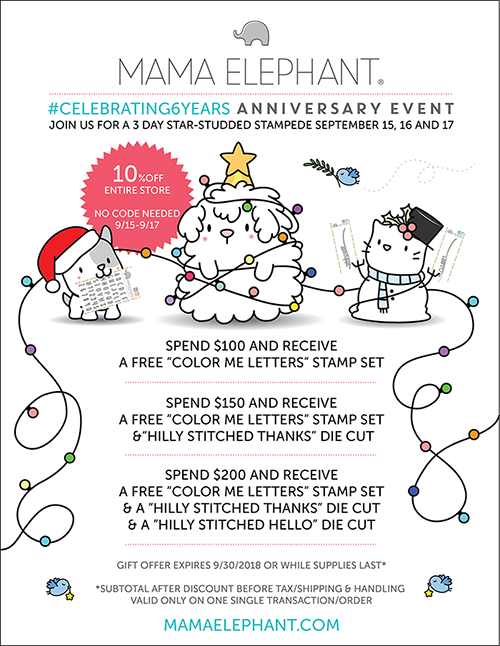 I’ve been a huge fan of Mama Elephant’s cute and fun images since I started crafting. I love their sweet, whimsical illustrative style and their cover creative cuts are a must have! If you’re following along the Stampede, you should have arrived here from the fabulous Amy Yang. I’ll list all of today’s Stampede participants below, if you want to start at the beginning. My first card today features the fun Little Elf Agenda. These little elves are so cute! I thought it would be fun to create a scene to show how little the elves are, so I decided to make a large stack of presents for them. I began by die cutting a rectangle and two squares from white card, leaving a small gap between each layer. I adhered the panel onto a card base, then used the same dies to cut some patterned paper, inlaying them into the panel. By using die cut inlay, it keeps the layers down and gives a nice finish. I took a length of silver sparkle twine and added it to the present using glue dot sheets for the adhesive. At the top, I added a twine bow with a mini glue dot. For the sentiment, I stamped a greeting from the Jolly & Merry stamp set underneath the present stack. Next, I stamped the images from Little Elf Agenda, and coloured them with copic markers. I die cut them with the coordinating dies, then added them to card with foam squares. These elves are adorable and look like they are having lots of fun! I especially love the one with the clipboard. I can just imagine her ordering the others around! My second card features the adorable Cool Penguins. I absolutely love this stamp set, these penguins are so sweet. It has such a fun holiday vibe, as the penguins busy themselves preparing for Christmas, giving cards and wrapping presents. I began by die cutting three circles from a piece of white card, cut to the same size as my card base. I then blended on dye inks in purples and pink directly on the card base so it shows through the circles. To add some Christmas sparkle, I put some liquid adhesive at the bottom edge of each inked circle then sprinkled glitter over, using my finger to burnish the glitter so it adhered down. Before adding the panel to the card base with foam tape, I heat embossed in silver one of the fabulous greetings from the Cool Penguins stamp set. Every time I see this sentiment, I want to sing the song! I stamped and coloured the Cool Penguins, using warm grey copic markers and adding some white gel pen details. I coloured the accessories with pinks and purples, then die cut all the images with the coordinating dies. I added the Cool Penguins to the card with foam tape, and the accessories with liquid glue. To finish, I added some Pretty Pink Posh clear sparkling sequins. Love the inventiveness of your first card with the stack of presents, and the gorgeous purple theme of the penguin card is beautiful! Your cards are seriously adorable. I mean, those penguins- AACK! I must sound like a lunatic from squealing every time I see them! Very cute cards. I like the stack of presents on the first one and the circle design with the penguins. Wow, such great cards! I love the elves on the stack of presents – adorable! Your cards are super cute! I can’t pick a favorite. You did a great job on both! I love all your cards but especially the penguin card!! I love penguins and yours are just too cute. I bought the set at midnight 🙂 Would you mind sharing which colour copic markers you used? Amazing thank you!! And can’t forget those cute pink cheeks! These penguins are to cute love how you put these together! Wow! What a grand idea to do large gifts with the tiny elves. The other card’s layout is super, using the cutout windows to focus on the penguins. I’ve just found one of my faves…. the Cool Penguins. These penguins are the best I’ve seen anywhere. Your cards are absolutely adorable! Love the stacked gifts with the elves. Great idea & super colouring on both! Such adorable cards. Great release. I feel like I’m saying Wow alot.. but WOW.. I am definitely going to add the penguin set to my wishlist! I love how you created the presents for the elves! So clever and just absolutely adorable. Thank you for sharing! Using the presents to show how tiny the elves are is such a good idea! The color scheme is so bright and cheery — perfect for such a playful Christmas card. I love the penguin card — the purples and pinks evoke the wintry connotations of the penguins, and they’re just so cute! I love your idea for the stacked presents! So clever. Love that big gift that the elves are on, so clever, and the penguins are just darling and I really love those soft purples in that card! Darn, I thought I didn’t need the Little Elf Agenda but now your card is making me want it! So cute! These are both so adorable!!! I LOVE the penguin card!! So cute and pretty in purple!